Squid surimi processed by isoelectric precipitation frequently has low gel strength, which is not suitable for elaborating certain products that require specific textural properties. On the other hand, this kind of surimi is suitable for preparing products resembling not only cooked products, but also raw products (marinated, smoked, etc.). Thus, a cold gel from squid surimi could be highly interesting. One way of achieving cold gelation would be the addition of microbial transglutaminase as a protein binding agent. Another way is applying isostatic high pressures, which denaturates the myofibrillar proteins and helps its gelification. The objective of the present work was to improve the physicochemical characteristics of cold and thermally induced gels by adding microbial transglutaminase (MTGase) and using isostatic high pressure (HP). 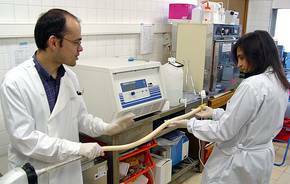 The work was carried out as a training study by Carlos Cardoso during a visit to the research institutes in Madrid. 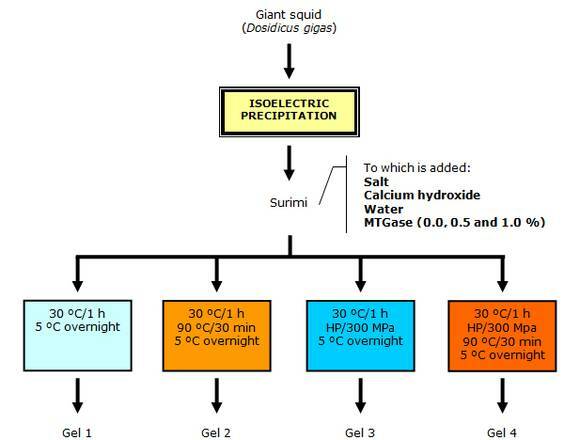 Giant squid surimi was homogenised with 3 % salt (adjusted moisture: 75 %) and the resulting samples (C: 0.0 % MTGase, A: 0.5 % MTGase, B:1.0 % MTGase) were prepared in a refrigerated (4-6 ºC) vacuum homogenizer, stuffed into 35-mm casings and subjected to four different treatments (1: 30 ºC/1 h + 5 ºC overnight; 2: 30 ºC/1 h + 90 ºC/30 min + 5 ºC overnight; 3: 30 ºC/1 h + HP/300 MPa + 5 ºC overnight; 4: 30 ºC/1 h + HP/300 MPa + 90 ºC/30 min + 5 ºC overnight). The gel preparation scheme is shown in Figure 1. Gels were subjected to several quality measurements: Water Binding Capacity (WBC), electrophoresis assay (SDS-PAGE), color measurement, mechanical properties, scanning electron microscopy and microbiological analysis. Addition of 0.5 % MTGase had a strong effect upon WBC (from 52.77 ± 7.42 to 61.73 ± 12.18 %), however, a greater MTGase content (1.0 %) did not bring any further benefits (from 61.73 ± 12.18 to 59.77 ± 12.94 %). HP also had an increasing effect, especially, in those samples without MTGase. Finally, thermal treatment clearly worsened the WBC of the gels. Thus, cold gelation ensured a better capacity to bind water. Electrophoresis analysis revealed a slight decreasing trend in the myosin heavy chain (MHC) proportion when MTGase concentration increased, due to specific bonds being established and, thereby, favouring greater protein polymerization. Concerning colour, lightness was higher in samples treated at 90 ºC than in those treated at 30 ºC. Furthermore, HP caused a slight darkening among raw products. Regarding mechanical properties, two different texture profile analyses (40 % compression) parameters were studied: hardness and cohesiveness. Samples subjected to HP and heat treatments showed significantly higher hardness values and, moreover, the highest contribution was due to the heat treatment. Addition of MTGase did not have any effect upon hardness of the heated products, either under HP or not. In contrast, raw products became harder with MTGase addition, specially, the gels without HP treatment. Cohesiveness of gels was not affected by HP treatment at 300MPa/30min/15ºC, with the exception of unheated samples without MTGase. For parameters measured during compression at 80 %, MTGase addition had a much larger effect upon the rupture force of thermally untreated products, whereas HP and heat treatment effects were similar to those found in hardness. Moreover, both HP treatment and MTGase increased rupture distance. In contrast, heat treatment, as in cohesiveness, decreased rupture distance. For puncture test results, it was found that the application of each of the three studied factors (HP, heat treatment and MTGase) improved markedly breaking force and gel strength. So, it was possible to produce an acceptable cold gelation (suwari) product with a gel strength of approx. 270 g.cm through the combination of high pressure treatment and 1.0 % MTGase. Results are summarised in Figure 2, and microscopic structure of giant squid surimi products can be seen in Figure 3. Concerning microbiological analyses, only heat treatment was successful in reducing initial counts. 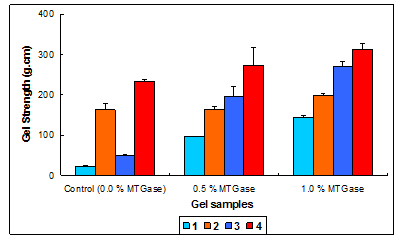 In gels induced at 30 ºC, whether subjected to high pressure or not, mechanical properties and water binding capacity (WBC) increased with higher MTGase content. In gels induced at 90 ºC, addition of MTGase only caused an increase of the gel strength in HP treated samples. 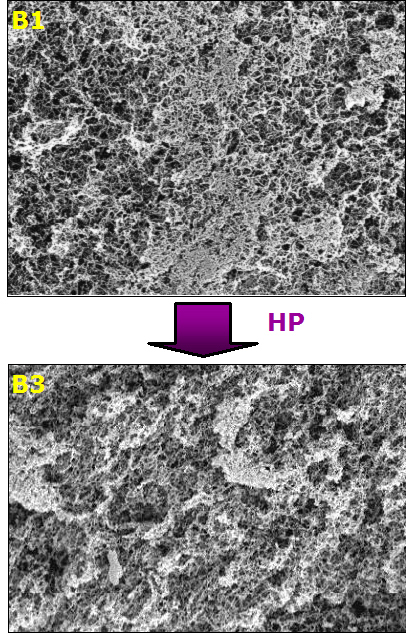 The treatment with HP at 300 Mpa improved all mechanical properties (except cohesiveness) and WBC for gels induced at 30 ºC and 90 ºC. Thus, it was possible to produce an acceptable cold gelation (suwari) product with a gel strength of approx 270 g.cm through the combination of high pressure treatment and 1.0 % MTGase. Participation of author Carlos Cardoso, from National Research Institute on Agriculture and Fisheries Research (Portugal), in this research work was funded by SEAFOODplus project, obtained in the 3rd internal call for training activities and mobility actions. 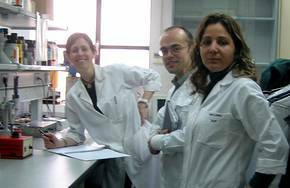 This research was supported by the Consejo Superior de Investigaciones Científicas for the Predoctoral Scholarship under program I3P-2004.